At this point, the phrase “Parkland survivors” tends to set my mind ready to get good and pissed off about whatever brand of stupid they’re trying to inflict on the American public. It’s annoying as hell, to be honest. So imagine my surprise when I found out that some of the survivors, including a March For Our Lives co-founder, was pushing for something stemming from that tragic day in February that wasn’t completely brain-dead? Kashuv was joined by March For Our Lives co-founder Cameron Kasky, the one member of that gaggle who seems to have realized he wasn’t as brilliant as he thought he was. For what it’s worth, I’ve already signed it. Wang was brave and selfless in his final act, putting his life at risk to save others. He would have made one hell of a warrior serving in this nation’s armed forces, but instead, his life was cut far too short. But in the process of his life ending, he saved many other lives, lives that may not have been here without his heroic sacrifice. 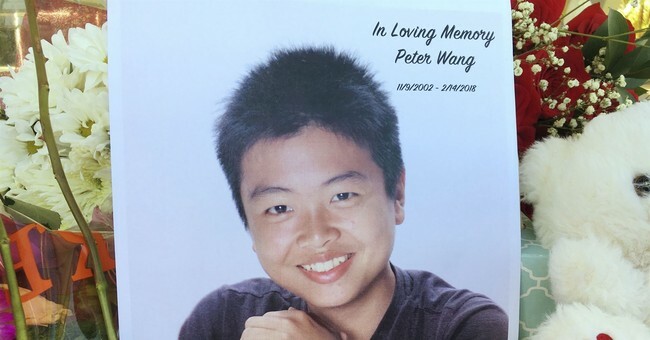 I get a little choked up over Wang’s death because my son was just a year older than Wang at the time and also in JROTC. Contrary to what anti-gunners might think, I do put myself in those parents’ places. I do think about it. I just disagree with the anti-gunners’ proposed solutions. But I do know that what Wang did transcends politics. It transcends everything else. The kid was a hero by any definition you want to use. He deserves to be recognized for that heroism. He’s already gotten some, as he was admitted to West Point honorarily, but he deserves more. A whole lot more. If you have a moment, please go to the petition and sign it.